Mark Twain called the late 19th century the Gilded Age as a play on Golden Age, referring to the way people gilded things with a thin layer to make them appear as solid gold. His novel by that same name satirizes the greed and corruption of the times. Those traits defined the age in some ways — maybe they do all ages — but it was also an era of tremendous economic growth as we saw in the last chapter. With the economy expanding and changing so quickly, political parties were less defined in their platforms and constituents than they are today. The Republicans — or GOP, for Grand Old Party — spurred industry but didn’t cater to the masses of workers who made the engine run. Yet the Democrats didn’t take full advantage of the opening that presented them. That left a void filled by more active third parties than at any time in American history. In this chapter, we’ll look at how the political system, local and national, responded to the growing economy of the industrial age and large-scale immigration. The Democratic Party struggled to reinvent itself after the Civil War. They were, in effect, the losers of the war, but remained solidly in control of the Southern states after the return of Redeemer (ex-Confederate) politicians in the 1870s. Democrats supported the Ku Klux Klan in the South while, in the North, they campaigned among the very Catholic, Jewish and Eastern European immigrants the Klan hated and hoped to keep out of the country. 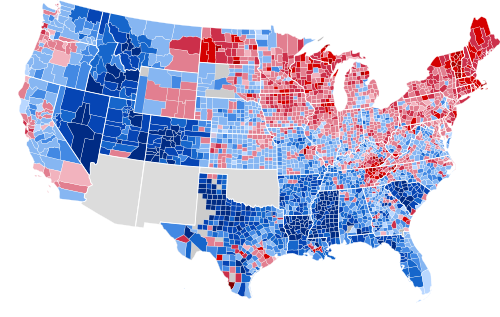 The Democrats were a mess nationally because they cast such a wide regional and ethnic net. In the North, they helped immigrants get on their feet in an era before employment agencies or institutionalized welfare. When immigrants arrived in New York’s Castle Gardens (or after 1892 Ellis Island), customs processed the vast majority, turning a few back for illness or quarantining them temporarily, like the young Vito Corleone in The Godfather II (1974). The teeming, ethnic neighborhoods of lower Manhattan and nearby boroughs were America’s prototypical “melting pots” and others landed in smaller ports like New Orleans and Galveston and moved to interior cities. It’s common today for people to distinguish themselves by saying that their ancestors were legal immigrants, but there wasn’t really any such thing as illegal immigration at the time. Onshore, a local precinct captain, alderman or ward boss, a foot soldier for the Democratic Party, greeted the newly-arrived immigrants. They offered to set the family up in a tenement apartment, find them a job, or take care of other little concerns to ease their transition. They might find a school or job for the kids (more likely job), keep utilities functioning, or even turn on the fire hydrant in summer heat. In exchange, it was understood that they would vote Democrat. In fact, they had to vote Democrat, or else. Voting wasn’t yet private, so people could see your ballot. By maintaining single-party rule over big cities, Democrats created rings, or political machines. Both parties ran machines and still do depending on how you define them (see HBO’s The Wire for a look at modern Baltimore), but they’re most famously associated with big-city Democrats in the late 19th and early 20th centuries, with Chicago’s Daley Machine lasting a bit longer. Democrats headquartered at Tammany Hall in New York City were infamous, as were their leaders Boss Tweed and George Washington Plunkitt. The mostly Irish-American machines were ideal for politicians looking to line their own pockets through graft: skimmed profit made possible by controlling the municipal government, including city hall, police, and utilities. Politicians in charge of dispensing contracts to construction companies expected kickbacks from winning bidders — enough to pay others to look the other way and keep the rest for themselves. Or, if they were popular enough among voters, they could even force city employees to pay them for the privilege of not being fired. There was a lot of money to be made as cities were growing rapidly and putting in streetcars, water lines, and gas and electric infrastructure. Mayor Plunkitt later conceded that the rate of kickbacks rose “accordin’ to the opportunities.” In Pittsburgh, the Democratic Party gave up any pretense of public bidding and just started their own private road-paving company. The system wasn’t entirely without merit, even as the machines left upper-middle-class reformers and taxpayers outraged (the initially Republican New York Times, for instance, railed against Tammany corruption). Chicago rebuilt quickly after a disastrous fire in 1871, as did San Francisco after its famous earthquake and fire in 1906. American cities were the best in the world by 1900 if measured by the quality of running water, access to electricity, or number of bridges, parks, and paved streets. In other words, stuff got done despite, or maybe because of, what Mayor Plunkitt called “honest graft.” Another upside was that the ward bosses provided some handouts to the working classes in an age before there were any formal social services. But their goal was not to lessen crime and disease by eradicating poverty so much as it was to capitalize on poor people by cashing in their votes. It was a parasitical, if functional, system. Tammany Hall supplemented their income by shaking down gamblers and prostitutes (leaving them in place to pay an informal tax) and even extorting protection money from small businesses in tandem with gangsters. Politicians “on the take” aren’t focused on curbing crime. Corrupt municipal politicians are still with us. One modern example of graft involving city contracts was Detroit in the early 21st century. Mayor Kwame Kilpatrick (D) and his family and friends pilfered everything they could before heading to prison, even winning one re-election in the process. While the $9.6 million they pocketed in kickbacks wasn’t the main cause of the Motor City’s $20 billion-dollar bankruptcy in 2013 — the largest in American municipal history — their corruption scared off potential business and bond investors, and their rampant bribery, fraud, and extortion schemes displaced effort they might otherwise have put into helping the struggling city. New York Republicans Dean Skelos and Michael Grimm were indicted for felonies in recent years. While there are plenty of local and state politicians today from both parties that end up in prison (see list), the term corruption is a somewhat misleading way to describe the rest because campaign donations offer interest groups and individuals a legal form of bribery. Wealthy donors usually don’t need to break the law when they can just pay politicians to change the law. Thus, people today are more likely to peddle influence with cash than to threaten violence. Conversely, any traditional “machine” truly deserving of the term worked with and reinforced organized crime. Gangsters “delivered” elections to politicians by intimidating voters or tapping union connections, most famously the Teamsters. Criminal control over the Teamsters Union, such as what occurred under the leadership of Cornelius Shea, meant that gangsters could demand political favors in exchange for “delivering” big blocks of voters and not disrupting the flow of goods in and out of a city. Gangsters beholden to politicians for keeping police off their backs could coerce unions to vote in one direction or the other. Politicians, to return the favor, wouldn’t interfere with the criminals’ rackets and, in the Teamsters’ case, the Mob skimmed off their union pension. Organized crime thrives in societies with either corrupt or weak local government. In U.S. history, often only federal law enforcement (or federally-backed local) has been strong enough to confront gangsters. Syndicates like the Mafia worked three sides of the organized labor equation: with companies to break strikes, with politicians to deliver votes, and with unions to intimidate strikebreakers, provide security, recruit new members, or jostle with other unions. Jimmy Hoffa’s Teamsters drove off a rival CIO union in 1930s Detroit with Mafia backing. Then the Mafia lent to Las Vegas casinos from the Teamsters’ pension and paid it back with cash skimmed from casino counting rooms while keeping plenty for themselves. Combined with torturing and murdering anyone who interfered, this provided a sustainable business model and built the Vegas Strip without reducing truckers’ retirement checks. Some criminal intimidation goes on today to prevent unionization in packing plants and service industries (see Eric Schlosser’s Fast Food Nation), but it’s not nearly as widespread as in the early 20th century. 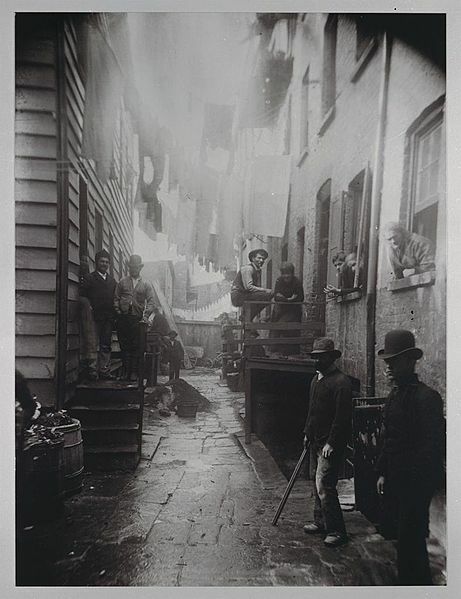 Then, gangs vied openly to control labor racketeering, as in New York’s Labor Slugger Wars of the 1910s and 20’s. In big cities, a lot of people owed a lot of other people a lot of favors. Once unions or governments owed organized criminals favors, gangsters could turn off people’s power, make sure their garbage wasn’t picked up, or ensure they couldn’t get necessary building permits. These “shakedowns” were friendly reminders that businessmen had to pay them for the privilege of doing business in that neighborhood. If the business owner resisted or didn’t understand the reminder, their shop would be destroyed or they’d be injured or killed to send a message to others. The Mafia offered “protection” to those that paid up insofar as they didn’t kill them and kept rival gangs away. Extortion rackets represented an underbelly of political machines. In some ways, protection rackets are miniature versions of politics in its most rudimentary form. Medieval kings collected taxes in exchange for protecting their subjects and that was pretty much all governments then did. We’ll examine organized crime more in Chapter 4 with Prohibition, and in Chapters 11 and 14 when the government cooperated with the Mafia in Sicily during World War II and during Castro’s Cuban Revolution. Americans can console themselves that compared to many countries, their political system hasn’t been as thoroughly rotted out. As mentioned, a form of pseudo-bribery called lobbying “corrupts” most tiers of the American system, depending on how one defines the term. Courts have defined campaign donations as lobbying which is, in turn, protected by the First Amendment right to “petition the government for a redress of grievances.” Lobbyists write the laws that politicians sign in exchange for funding expensive campaigns and personal gifts. But, at the local level, most of us would be surprised if we went to the Department of Motor Vehicles and the clerk asked for an extra $50 to make sure our driver’s license got processed correctly. Our first reaction would be to seek out the employee’s boss and file a complaint. Such a reaction would be considered naïve in much of the world, where petty corruption and bribes are a way of life. And, while paperwork and bureaucracy in America can be onerous, it’s not as bad as elsewhere. If you wanted to start something as simple as a lemonade stand in New York City in 2018, you’d be looking at around 65 days of red tape before opening day. In many countries, you’d spend a few years navigating the bureaucracy, at which point you would’ve paid so many bribes you’d struggle to get out of debt; better to become a bureaucrat and stay on the receiving end. In poorer countries, graft is the very reason many people seek work in local government, whereas in the U.S. some politicians seek higher office for unscrupulous gain but not a job in the DMV or post office. 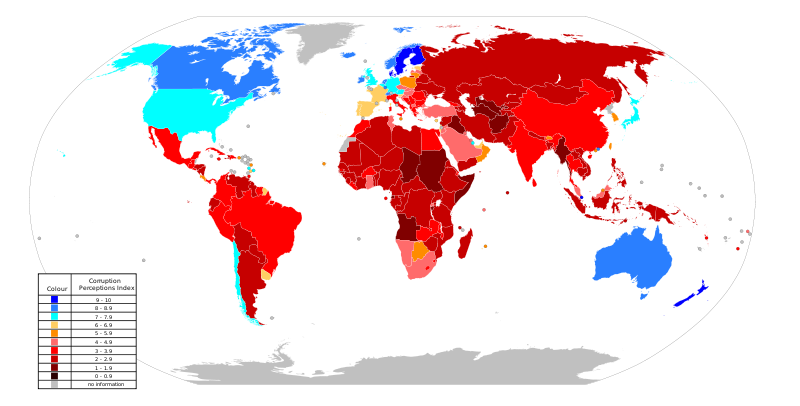 Corruption in developed countries, while widespread, is more functional and less debilitating than poor countries even though the corruption that does exist is still an ongoing waste of taxpayer money and warps public policy. We’ve meandered around long enough exploring the corrupt if functional byzantine underbelly of big city politics and diverted into tangents on modern lobbying and bureaucracy. The key takeaway here is that, during the Gilded Age, the united GOP represented business interests and northern upper-middle classes while the Democrats were cobbled together. Democrats dominated local politics in the South by pandering to racism and in northern cities with political machines made possible partly by one-party rule and law enforcement too weak to confront the organized crime with which machines operated. Democrats didn’t make a concerted play nationally for blue-collar workers on farms and ranches and in factories and mines. Instead, the Bourbon Democrats led by President Grover Cleveland (1885-89 & 1893-97) endorsed free markets and tried to compete with pro-business Republicans while distancing themselves from labor. Workers accurately saw both parties as “in the pocket” of business interests. This left a window of opportunity for third parties to appeal to workers on the left side of the political spectrum, which we’ll unpack later in the chapter. First, we’ll examine American labor in more detail. Gilded Age politicians operated in the thriving industrial economy we explored in Chapter 1, but it was uneven in terms of both wealth distribution and growth rates. Capitalist economies are cyclical, moving through cycles of booms and busts, and the busts hit the working classes hardest. Management and labor didn’t get along well in the late 19th century, especially during downturns like the Panic of 1873 and Panic of 1893. Miners and factory workers could unionize but management could fire the workers or break up strikes with force. Unions lacked the legal right to collective bargaining, meaning that management wasn’t compelled to negotiate with unions the way they were in many industries after the 1930s and some today. While government maintained a mostly laissez-faire (or free market) hands-off policy toward business, they were willing to intervene in strikes on behalf of management. Business owners could call out state militias, federal troops, or Pinkerton or Baldwin-Felts detectives to dispel strikers or even attack them. If troops weren’t available, they could find some “muscle” (thugs) looking to cash in. This happened several times in the late 19th and early 20th centuries, including the Great Railroad Strike of 1877, the Homestead Strike at Andrew Carnegie’s steel mill in 1892, the Pullman Strike in Chicago in 1894, and Rockefeller Jr.’s Ludlow, Colorado mine in 1913. Carnegie fancied himself as running a progressive company and didn’t have the nerve to crack down hard on workers who were protesting their 72-hour weeks. He hired Henry Frick as his right-hand man to deal with strikers, renegotiate contracts with suppliers, and cut labor costs, then left for his native Scotland on vacation. Workers took over Homestead and Frick hired the Pinkerton Detectives to break their strike. Pinkertons were America’s mercenary force, hired mostly to apprehend train robbers and, during the Civil War, to protect Lincoln from assassination. 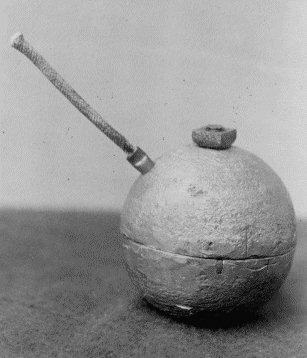 By the 1870s, they had more firepower than the slimmed down U.S. Army. 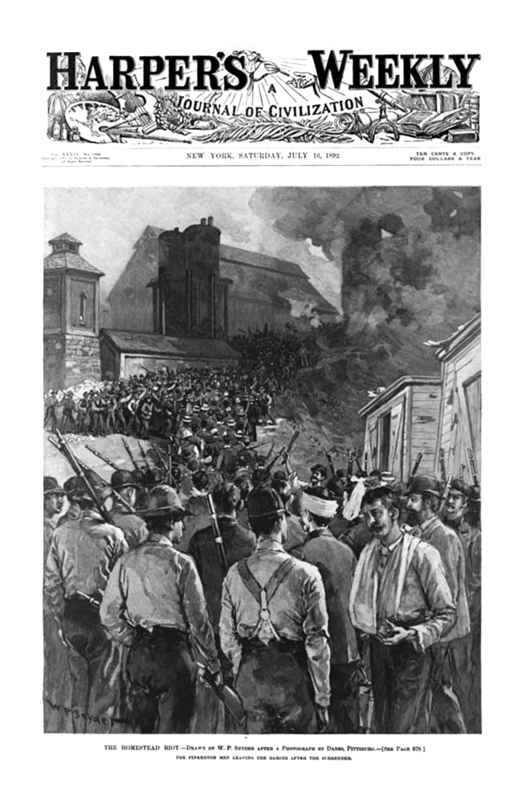 At Homestead, Pinkertons killed nine workers and the governor called in two brigades of state militia to restore order. They ended the strike and production resumed with no gains for workers. Carnegie was wise (if cowardly) to hide out in Scotland; the public blamed Frick and an anarchist shot and stabbed him, but he survived. At Pullman’s plant, the disruption of train car manufacturing slowed down the region’s economy to the point that federal troops came in to break the strike, killing 30 and injuring 57 workers. George Pullman was a generous boss, building an upscale company town on Chicago’s south side with schools and churches for his employees, but the Panic of 1893 caused him to lower pay and lay off workers without lowering rents in the town’s homes they weren’t allowed to own. This triggered a violent “wildcat strike” (strike initiated without union authorization) and boycott of all trains using Pullman cars (most). 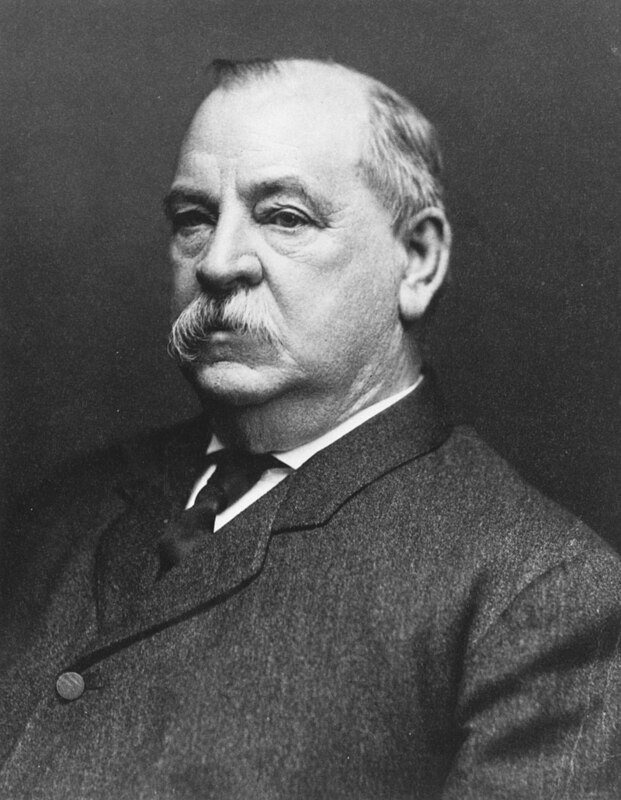 Although he’d sent in troops, President Grover Cleveland tried to appease the workers, declaring the Labor Day holiday as compensation for their losses. 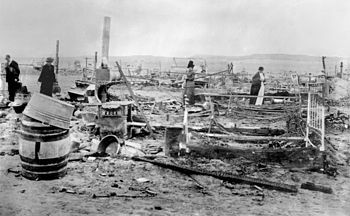 Even more dramatic, one of John D. Rockefeller Jr.’s subsidiaries, Colorado Fuel & Iron Co., ordered a military attack on its mining town in Ludlow in 1913, where the Colorado National Guard killed twenty-five people, including eleven kids, some asphyxiated in their tents. In this company town, like many others, workers were paid in coupons only redeemable at the company store, and the death rate was double the national mining average. In response to the National Guard’s massacre, coal miners retaliated throughout the state, killing dozens of troops and Baldwin-Felts agents. The Colorado Coalfield War, overall, was the worst strike-related violence in American history, prompting Congress to push legislation on child labor and the 8-hour day. 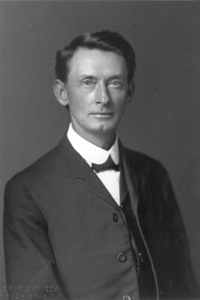 Rockefeller himself ordered an investigation into the incident, though the strikers lost and went back to work. That form of virtual enslavement is called peonage and its victims are known as debt peons. When Blacks in the post-Civil War South tried to break away from sharecropping and farm their own land, they often found themselves in peonage. For an excellent cinematic treatment of the miners’ plight see John Sayles Matewan (1987), set in a West Virginia coal-mining town in 1920. Like Ludlow, federal troops attacked Matewan’s workers, in this case bombing them from Martin MB-1’s. Matewan climaxed eight years of labor tension and violence in West Virginia known collectively as the Mine Wars. 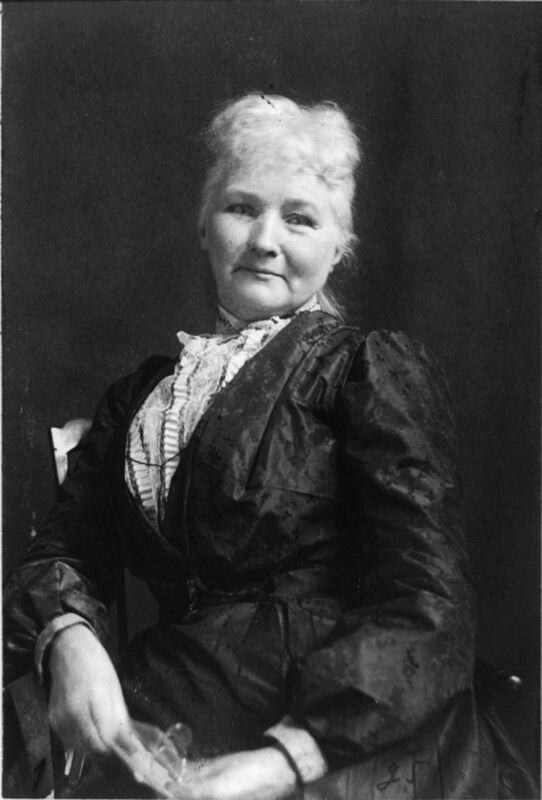 While mining companies supplemented troops with hired muscle in the form of Baldwin-Felts agents, coal miners led by Mother Jones — now famous for a namesake leftist magazine — armed themselves more heavily than most labor disputes. Near the town of Matewan in 1920, around a hundred miners and strikebreakers died in the Battle of Blair Mountain, leading to nearly a thousand arrests after the biggest single armed shootout in the U.S. since the Civil War. West Virginia’s state government declared martial law, seizing thousands of high-powered rifles and rounds of ammunition along with a few machine guns and assorted blackjacks, daggers, bayonets, and brass knuckles. The short-term result was a victory for management and membership in the United Mine Workers plummeted in the 1920s. 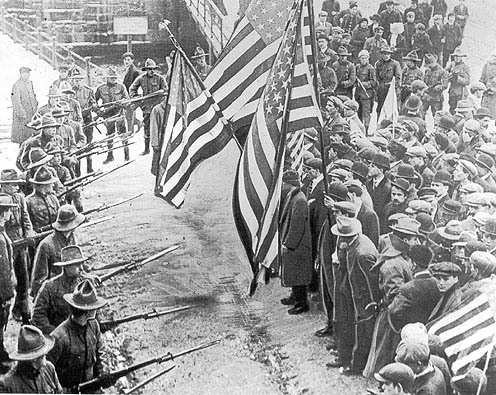 However, widespread anger over Ludlow and Matewan rallied workers nationwide and helped lead to the right to collective bargaining during the New Deal of the 1930s and the strengthening of a larger umbrella labor union, the AFL-CIO. Prior to the 1930s, American workers had less leverage than those in other countries because there were ongoing waves of immigrants willing to work for lower wages than the preceding group. When Chinese workers arrived in Rock Springs, Wyoming in 1885, willing to work for lower wages than Irish and Italian miners, the Union Pacific’s coal department naturally hired them and fired the Europeans. Whites took matters into their own hands, killing 28 Asians and burning 75 homes. You might think the government would’ve supported them in that case due to racism, but they backed the Chinese because they provided cheaper labor. Troops escorted the survivors back to town. Rock Springs triggered smaller, sporadic violence against Asians across the West, such as attacks on hop-pickers in Issaquah, Washington, outside Seattle. The Chinese had served their purpose by building the railroads, so “Native Americans” (Whites) of the Northwest chased most of them away. The U.S. passed anti-immigration legislation aimed at Chinese in the 1880s while some of those already in the country were literally forced underground in Seattle and Portland. How would the political system respond to class tension? Working classes had won the right to vote in America, but neither major political party seemed eager to court their vote. Republicans represented management and Democrats were hesitant to be associated with any labor groups that middle classes viewed as anarchistic or revolutionary. Grover Cleveland made sure that American Labor Day would be September 1st, not the May 1st celebrated in many countries as International Workers’ Day. America also had a handful of anarchists, who believed that all government was oppressive and all capitalism was theft. In 1886, someone threw a bomb into the crowd at the Haymarket Riot in Chicago, killing seven policemen. The gathering had begun as a peaceful demonstration in favor of 8-hour workdays. No one ever knew who actually tossed the bomb, but newspapers were quick to depict all the strikers as violent revolutionaries and a chemist testified that shrapnel found at the scene matched a bomb found in one anarchist’s apartment. 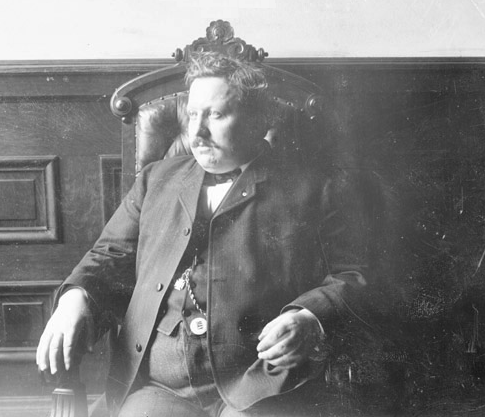 President Cleveland came down on management’s side, just as he did in the Pullman Strike eight years later (Cleveland was the only president to ever serve discontinuous terms, though Teddy Roosevelt tried and failed). Leftists groups like the Industrial Workers of the World (aka Wobblies) fought fire with fire, willing to fight back against repression with baseball bats of their own. However, that made them susceptible to being arrested or deported, and the Marxist (communist) solution of workers seizing the means of production (factories and mines in this case) never gained traction in America. The U.S. was a country defined by opportunity and the right of enterprising people to rise up and get ahead, not a place that punished those that got ahead by stealing their businesses from them. And virtually no Americans favored suspending representative government in favor of a communist dictatorship. 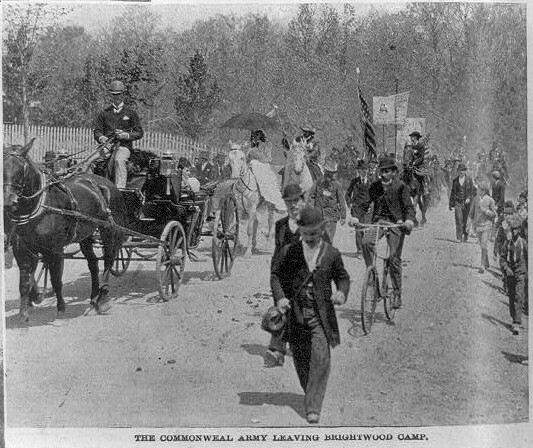 In 1894, Coxey’s Army, officially the Army of the Commonweal in Christ, tried a different tack. Hundreds of unemployed marched on Washington — the first of many such marches in U.S. history — to demand that the government create public works jobs for them, paid in newly printed currency to put more cash in circulation. 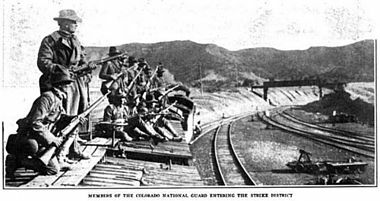 Thousands fell in and joined Coxey as his army marched across the country, while others rode trains from the West. Since there was massive unemployment of ~20% after the 1893 Panic and roads were in terrible shape, why not have the government put people to work building and repairing roads? Instead, they were arrested for stepping on Capitol grass and the movement dwindled. Coxey was fined $5 and sentenced to 20 days in jail for carrying a picket on Capitol grounds. While lambasted and lampooned by politicians of both parties and journalists, Coxey’s idea laid the foundation for public works stimulus packages during the Great Depression of the 1930s. Democratic socialism, roughly similar to what’s practiced today in Canada, Europe, and Japan, was a more popular option than Marxism or walking a thousand miles only to be arrested for trampling congressional grass. America’s democratic socialists proposed using the vote to create a regulated capitalist economy that benefited all rather than just a few. 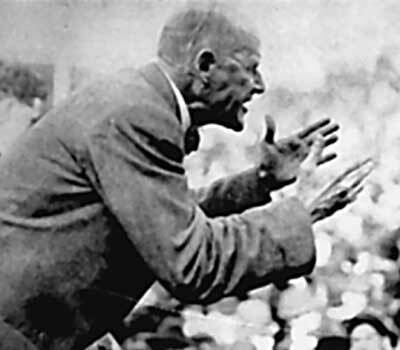 Their leader Eugene V. Debs garnered 6% of the presidential vote in the 1912 election, an impressive showing considering that it was a four-horse race, including a progressive in Teddy Roosevelt, and that the Left had no mainstream history to build on in America. The government had jailed Debs for overriding a court injunction to lead the secondary (concurrent) railroad boycott during the Pullman Strike in 1894. In jail, he read up on democratic socialism, liked the sound of it and converted. 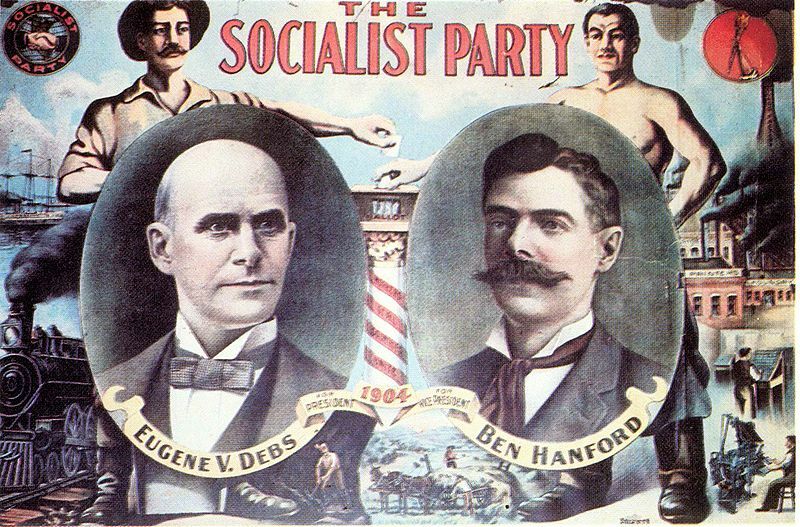 Out of jail, Debs started the Democratic Socialist Party of America in 1901 and gained a significant following in Southern Plains states like Texas and Oklahoma, running for president in 1912. Then, arrested for protesting America’s entry into World War I, Debs garnered 3.4% of the presidential vote from prison in 1920, setting the record for inmates. More popular among farmers and rural workers was the People’s Party, or Populists — “Pops” for short — an initially loose conglomeration of granges, co-ops, and alliances that emerged in response to exploitive railroads and banks. The revolution began in Kansas led by Annie Diggs and Mary Elizabeth Lease but spread across rural America in the 1890s. 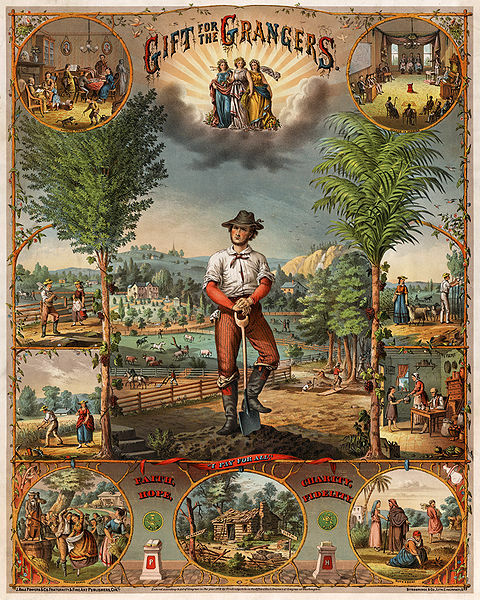 Populists included grain and cotton farmers, coal miners, and railroad workers, among others. Friction with railroads stemmed from all the free land the government had doled out to freight companies. They didn’t grant just narrow strips, but rather wide swaths to resell cheaply or give away as farmland (in yellow below). 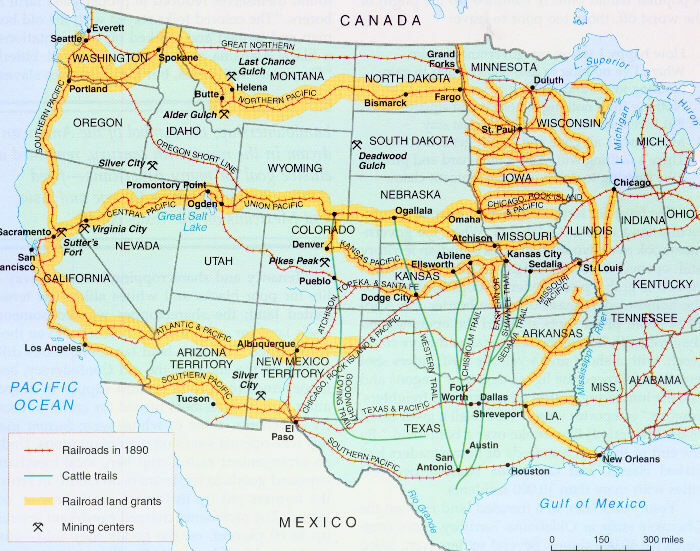 West of the Mississippi, the government gave more land to railroads than the total size of New England. When railroads re-sold the land, it was a seemingly great deal for European immigrants and Eastern farmers looking for a fresh start, but there was a catch. Similar to how printers are cheap today but ink is expensive, farmers got cheap land but then had only one option to ship produce and livestock back east. The freight companies could charge what they pleased, including different rates to different customers depending on how vulnerable they were. Desperate farmers joined forces, similar to the way factory workers formed unions. In their case, they formed cartels called granges to set price basements, below which no one would sell commodities to the railroads. The biggest such organization struggled to come up with a snappy name, eventually settling on the National Grange of the Order of Patrons of Husbandry. 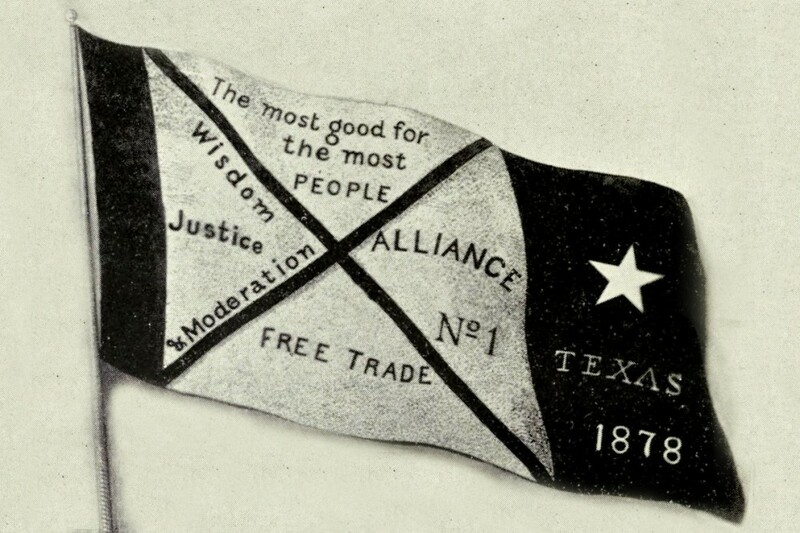 In 1875, the first Farmer’s Alliance formed in Lampasas County, Texas to protest the power of commodities brokers to dictate which crops farmers grew. Groups like the Farmer’s Alliance congealed into the broader Populist movement by 1892. While the original purpose of these granges was economic, they expanded into dances, barbecues, and sewing bees, forming the social fabric of the rural South and Plains in the late 19th century. No one wants to pay unfair shipping rates, but it’s also important to gossip, have a good time, and marry off your kids. The Populists were the first grass-roots political party in U.S. history and illustrate well both the potential of participatory democracy and its limitations. Without big financial backing, they never actually won control of the Presidency or Congress, but they appealed to enough voters that the two-party system had to take notice of their platform. Populists eventually influenced Democrats and progressive Republicans even though, at first, nothing came of their 1892 Omaha Platform. But starting in 1894 the Democrats endorsed the Populists’ idea of a national income tax to redistribute wealth and some claim that Populists also originated the idea of a Federal Reserve. Other Populist ideas gradually came to fruition, including railroad and bank regulation, direct democracy (in the form of referendums, propositions, recalls, and initiatives), and the first major regulatory agency, the Interstate Commerce Commission. Most significantly, they influenced two constitutional amendments: the 16th of 1913 that created the Federal Income Tax and the 17th mandating direct election of senators (citizens originally only voted for the lower House of Representatives while state legislatures elected Senators). The 16th Amendment redistributed wealth since the tax code was graduated, or progressive, with rates (not just totals) escalating with higher incomes. Redistribution wasn’t dramatic at first but was significant for portions of the mid-20th century before the top brackets came back down in the 1980s, and even today top rates are moderately higher for income if not investments (more in Chapter 5). There was a national income tax once before, during the Civil War, but the Supreme Court deemed it unconstitutional prior to the 16th Amendment. Populists also brought about private “Australian” polling so that voters could no longer be intimidated, bribed or charmed at the voting booth, and public ownership of the telephone-telegraph companies. As we saw in the previous chapter, Ma Bell, named for telephone inventor Alexander Graham Bell, broke up in 1984, leading to the private “Baby Bells” of AT&T, Verizon, CenturyLink, etc. Today both parties complain from time to time of voter intimidation at the polls, but whoever is doing the “intimidating” can’t see who the voters are voting for, unlike the 19th century. They can only intimidate by profiling people and keeping them away from the polls. Watson’s brand of xenophobia weaves its way in and out of American history and we’ll revisit immigration in Chapter 7 when the U.S. passes a law keeping out most Old World “hordes” from 1924 to ’65. Populism presents a quandary for young historians prone to dualistic stories of good guys (immigrants and working classes) versus bad (“The man”). As developed in more detail in the optional article at the bottom of the chapter, working classes already in America often don’t favor lenient immigration. Similarly, some Suffragists allied with racists to oppose black men winning the vote before white women. A full picture of Populism includes its bigoted and often ignorant underbelly, along with consideration for that fact that banks who loan farmers money have a right to expect it back under agreed upon terms. Otherwise, for one thing, they’d eventually go out of business and be unable to lend to future farmers. However, banks charged usuriously high interest rates of 20-30% to some during the Gilded Age. Many of these sodbusters remembered a time when they were more or less self-sufficient and naturally resented falling further and further behind to Eastern corporations despite working hard. For many, fighting back politically wasn’t just a matter of resentment, but even survival. While the Populist Party isn’t around anymore and economic populism is mostly dead — or at least on life support in the form of Occupy Wall Street, Senator Elizabeth Warren (D-MA), Bernie Sanders‘ 2016 campaign, or perhaps Steve Bannon — the granger spirit lives on in member-owned companies called cooperatives. The first co-op predated the Populists and was also the nation’s first department store: Brigham Young’s Zionist Cooperative Mercantile Institution (ZCMI) opened in Salt Lake City in 1868. Cooperatives aren’t cartels like the granges, but their businesses keep control in the hands of members and employees instead of upper management or corporate boards. Independent retailers, for instance, “chain” together to form Ace Hardware and True Value. Credit unions are member-owned banks. Texas has rural electrical, food, housing, and radio co-ops and even an incubator called Cooperation Texas. Here in Austin, we have Wheatsville Food (1976- ) and Black Star Pub & Brewery (2010- ) that, in turn, inspired more brewpub co-ops in Austin (4th Tap), Los Alamos, NM (Bathtub Row), Seattle (Flying Bike), Minneapolis (Fair State), and Dayton (Fifth Street). Not all co-ops are small. There’s the national REI retail chain and farmers/ranchers own St. Paul-based Fortune 100 company Cenex Harvest States, or CHS. Others include W.W. Norton & Co. (publishers), Land O’Lakes, Ocean Spray, Sunkist, Welch’s, Organic Valley, and New Belgian Brewing (Fat Tire). Nearly a billion people worldwide belong to cooperatives and they employ more people (100 million) overall than multinational corporations. The Populists were waning by the late 1890s, but still had too much power to be ignored. Democrats reached out to co-opt them, just as Republicans have soaked up Tea Partiers and the Freedom Caucus more recently. In this case, Democrats got crushed outside the South in the 1894 midterms and needed to expand their geographic footprint. One historian noted that third parties are like honey bees: “Once they’ve stung, they die.” But co-opting cuts both ways, as this cartoon with a Populist snake devouring the Democrats indicated and as the modern GOP has discovered with the Tea Party/Freedom Caucus and Donald Trump. These divergent groups borrow tactics from each other. 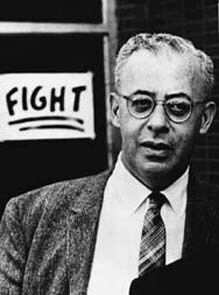 The conservative/libertarian FreedomWorks, for instance, taps into Saul Alinsky’s Rules for Radicals (1971) even though Alinsky (right) was famous for leftist community organizing. Democrats also tapped into farmers’ frustration at the lack of currency in circulation. They pushed for printing more money by converting the U.S. from a gold standard, whereby paper money corresponded to bullion in treasury vaults, to a bimetallic standard of gold and silver. Printing more money is inflationary, but farmers were more likely to be debtors, borrowing in the spring to plant and paying back in the fall after harvesting. Business leaders and creditors (lenders) supported the traditional gold standard and disliked inflation. Unlike debtors who profit from inflation (e.g. students, homebuyers, farmers, governments), creditors lose money when people repay later after the original amount borrowed in nominal dollars is worth less than the real amount in adjusted dollars. Earlier, the reverse process sparked the Greenback movement among farmers because the real value of their loans was going up with deflation (Greenbacks ran James Weaver as a third-party presidential candidate in 1880). In the growing economy of the late 19th century, paper money was tied to the finite gold supply. Even now, all the gold ever mined would only fill up three Olympic swimming pools, or a third of the Washington Monument. Democrats lobbied for unlimited silver coinage after debate at their 1896 convention in Chicago, where Silverites derided incumbent president Grover Cleveland and the Bourbon Democrats for cratering to banker J.P. Morgan by keeping the U.S. on the gold standard. William McKinley (R), a Civil War veteran, defeated William Jennings Bryan (D, P) twice, in 1896 and 1900. 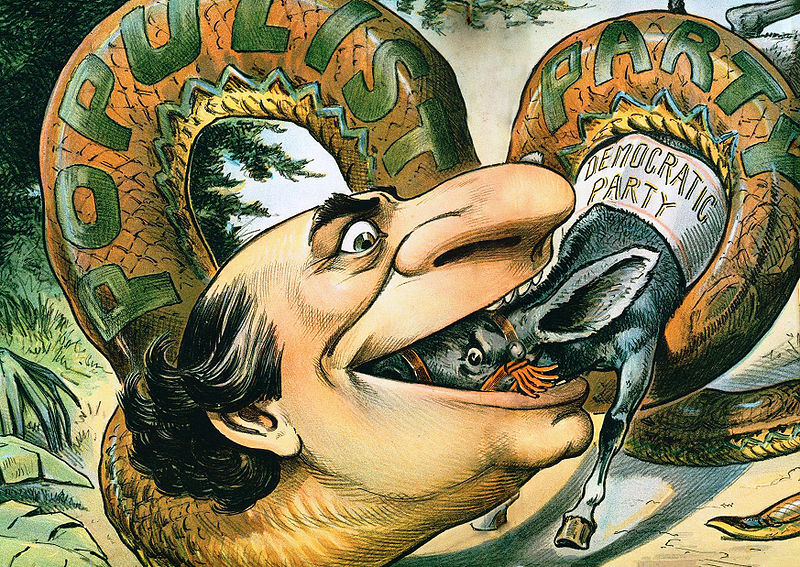 The 1896 election signaled entrenchment of the two-party system, with the Democrats having soaked up the Populists, even though, according to our cartoon, they were being digested by the Populist snake. It was also the first election when Republicans openly collected corporate campaign donations. Carnegie, Rockefeller, and Morgan resolved to put their differences aside temporarily and buy themselves a president, each pitching in around $20 million adjusted for inflation. 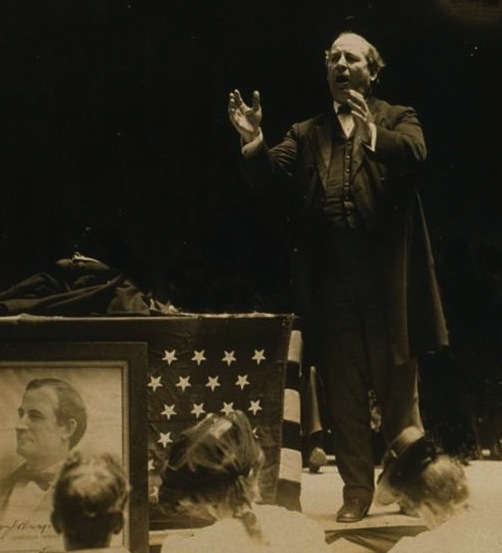 That bought them, among other things, editorial rights over their candidate McKinley’s speeches. Some background on campaign finance is in order here. In 1881, a campaign supporter killed President James Garfield because he was denied a government post. Congress reacted by creating the Civil Service to provide such jobs based on actual merit, cutting off patronage as a source of campaign influence. However, in a classic case of regulation solving one problem by creating another, that had the unintended effect of sending politicians elsewhere for funds. GOP campaign manager Mark Hanna demanded campaign donations from the country’s biggest corporations, impressing upon them that the alternative of having a worker-friendly president and “revolutionary, anarchistic” Democrats would be far worse. That wouldn’t have been the case if Grover Cleveland was still the Bourbon Democratic candidate, but W.J. Bryan threatened the “Top 1%.” The results were nearly as regional as the Civil War-era 1860 election. The Industrial Revolution of the Gilded Age pitted workers against the wealthy and leftist historians mark the 1896 election as a point when money and capitalism won out over democracy and equality. The government tossed Coxey in jail, sent in troops to break strikers in Pittsburgh and Chicago, and Robber Barons bought the 1896 election, blunting the will of the people as represented by the Populist-infused Democratic Party, according to this narrative. The GOP told workers that they were already being paid well and that their paychecks were only worth something because the government backed their cash with gold. However, in 1896 the Republicans didn’t just squash farmers, miners, and factory workers; they made their own policies more worker-friendly. Here’s how. The overriding problem plaguing the American economy was over-production. Farmers were growing more food than Americans could eat and factories were making more goods than Americans could consume. Simply put, production was outrunning consumption. 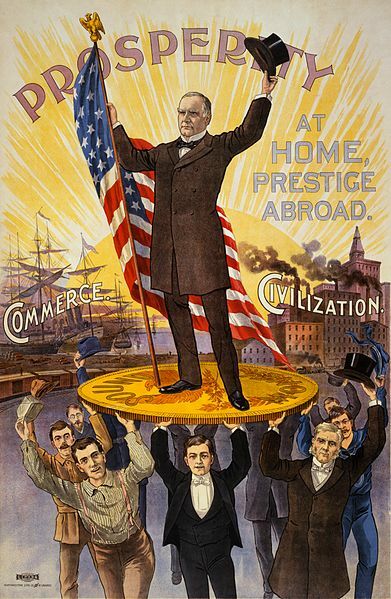 The solution Republican candidate William McKinley offered was to expand militarily and tap overseas markets. That would not only be good for business, it would fill the plates of workers. 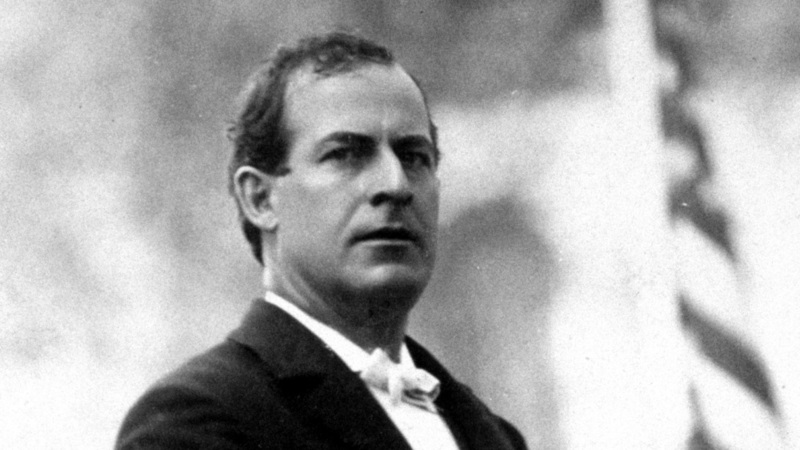 McKinley flipped the script on Bryan’s trickle-up theory, arguing instead that money would trickle down from spenders and job-creators to workers — or, as he put it in his 1900 campaign slogan, a “full lunch pail.” For good measure, Republican managers told factory workers they’d be locked out if they voted for William Jennings Bryan and monitored polling stations. 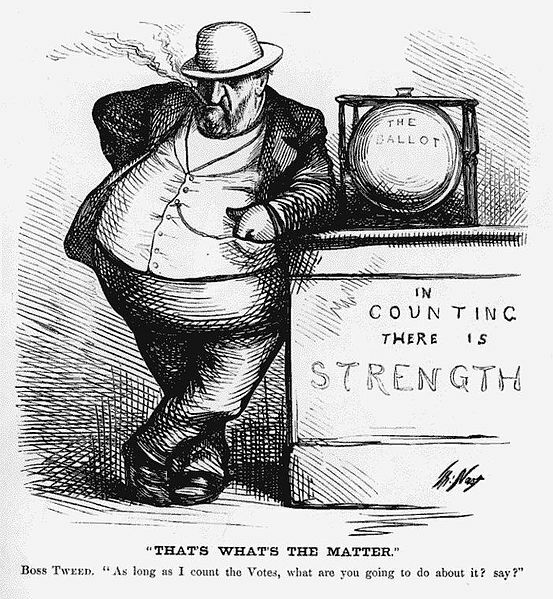 The 1896 election thus led directly to the private polling that Populists supported and later got enacted. For more good measure, the GOP dropped alcohol prohibition from its platform hoping to win some immigrant votes. 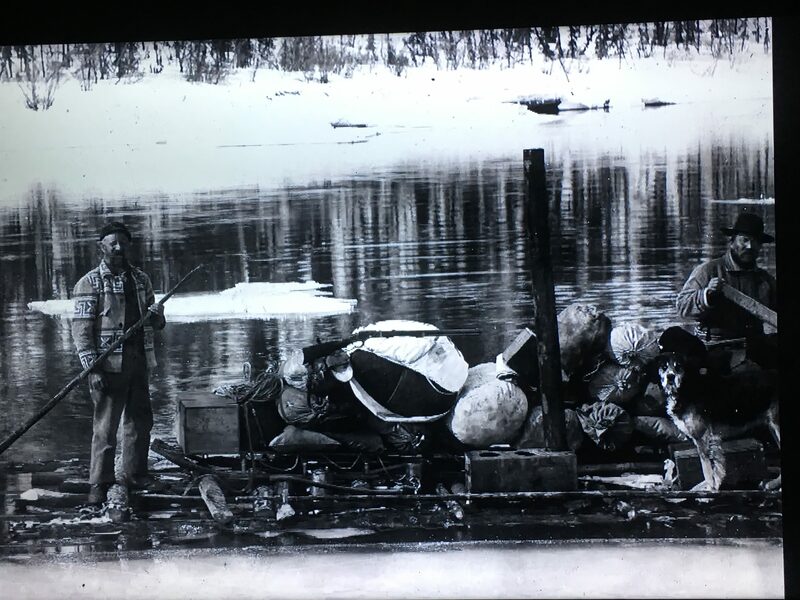 The discovery of gold in Alaska and the Yukon Territory in 1896 allowed the government to print off more money while staying on the gold standard, ending the bimetallic controversy. The monetary stimulus helped the economy get out of the recession. After the election, the two main parties colluded to make it more difficult for third parties like the Populists to get on ballots. Like their southern counterparts, northern states instituted literacy tests, in their case to disenfranchise immigrants rather than Blacks and Hispanics. Having excluded much of the “riff-raff” they didn’t want in the democracy, the parties felt comfortable turning to primaries to decide their candidates. Unlike primaries conducted since the 1970s, those of the early 20th century were just elaborate opinion polls rather than being binding. Since today’s primaries actually determine candidates (superdelegates notwithstanding) and changes in the 1960s banned voting restrictions like literacy tests, Gilded Age laws enacted to make the country less democratic ironically made it more democratic in the long run by introducing primaries. President McKinley defeated W.J. Bryan again in 1900, but a loner anarchist named Leon Czolgosz (shul-gosh) shot and killed him at Buffalo’s Pan-American Expo in 1901, catapulting his new VP Teddy Roosevelt to office. 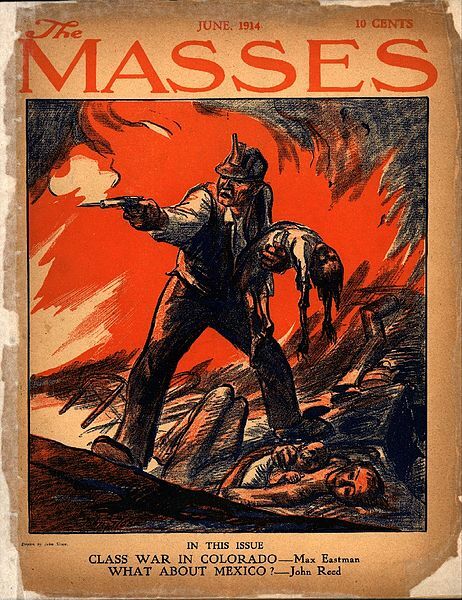 Czolgosz, a Polish immigrant, was laid off at one of the steel mills taken over by J.P. Morgan’s U.S. Steel conglomerate and felt McKinley was to blame. After his bosses blacklisted him for striking he took on the alias Niman, German for nobody. Anarchist clubs rejected him because they thought he was nuts and seemed too eager to kill leaders. The anarchist clubs rejected him, in other words, because they feared he was a true anarchist. He seems to have gone after McKinley to win them over and purchased the same model .32-caliber Iver Johnson revolver another anarchist used to assassinate King Humbert of Italy in 1890. Some Thomas Edison footage captures the crowd outside the building as news of the shooting spread. 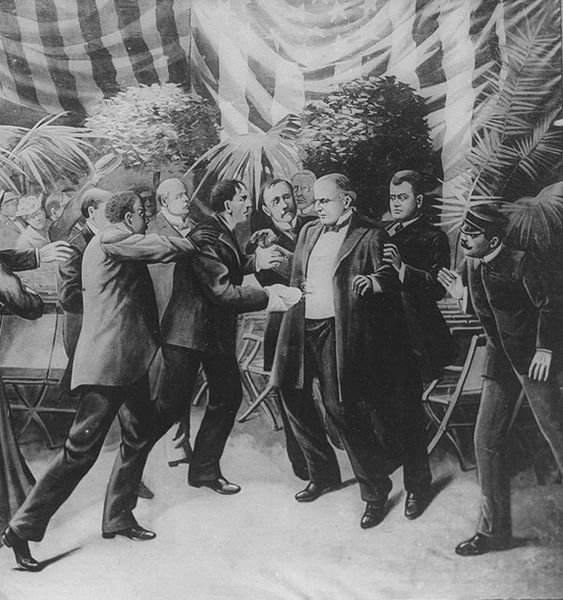 The wounded McKinley told the crowd to go easy on Czolgosz and to break the news gently to his wife, Ida, as they took him off to a makeshift operating room to repair his torn stomach. He died a few days later, saying, “It is God’s way…His will be done.” Edison capitalized by filming a re-enactment of Czolgosz’ electrocution.